Spot dolphins on Scotland's sunshine coast from this campsite. Nestled within a beautiful Highland forest, our Club campsite at Nairn is level and well sheltered and has a rural feel. You might even be lucky enough to spot a red squirrel or two. There are well maintained facilities, including a laundry and a recreation room with table tennis, also a small site shop. The site’s delightful location offers extensive walking directly into the wood. There is also a great walk to the beach. The attractive seaside town of Nairn has two Blue Flag beaches and a promenade with fantastic views over the Moray Firth. Nairn is also a centre of golfing excellence with two 18-hole championship golf courses - the Nairn Golf Club and Castle Stewart which is a regular host of the Scottish Open. Within an hour’s drive of the town you can visit Cawdor Castle, Brodie Castle, Culloden Battlefield, Fort George, Clava Stones, Loch Ness, Castle Urquhart, Culbin Forest and the new viewpoint tower, the Cairngorms National Park, Cairngorm Mountain Railway, the Strathspey Steam Railway, Ballindalloch Castle, Elgin Cathedral and the Whisky Trail. Inverness is 15 miles from the campsite. Here you can explore its old town or enjoy walks along the Caledonian Canal and the River Ness. Or take a boat trip to see the resident bottle-nose dolphins in the Moray Firth. 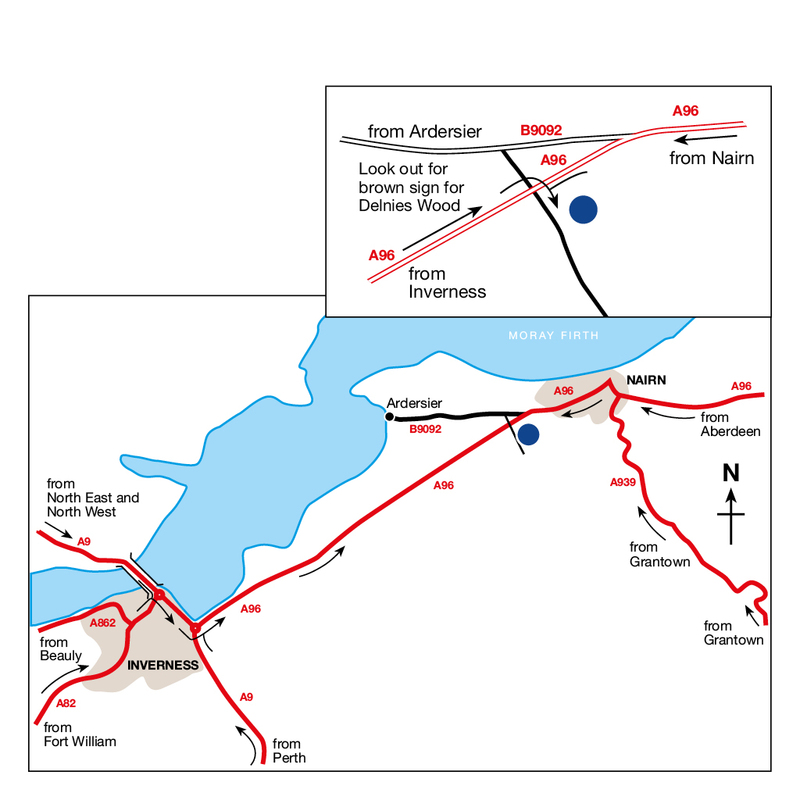 Those travelling through Inverness should follow the signs to Aberdeen to pick up the A96 towards Nairn. Digital aerial required. Satellite reception not available due to trees and location. Caravan Holiday Homes are available for purchase. Farmers’ market in Inverness on the first Saturday of the month. Ardersier and Nairn Farmers’ Market is advertised locally. Wester Hardmuir Fruit Farm has pick your own fruit from June–August. Mobile fish & chip van visits site on Tuesday evenings, April–September. A lengthy promenade which is ideal for a scenic seaside stroll, Nairn Beach is always a popular destination for tourists. Sample some food at the local cafes and restaurants, or pack a lunch and utilise the spacious picnic area. Arguably most famous for featuring in William Shakespeare’s Macbeth, Cawdor Castle is a magnificent example of Scottish Baronial architecture. Built in 1454, folklore states that the site was chosen after a donkey, laden with gold, lay down to rest on the ground. Popular with wildlife admirers due to the number of dolphins that are spotted nearby, Chanonry Point boasts a towering lighthouse that soars above the bay and provides panoramic views of the coastline. You will find a real taste of the Scottish Highlands in this area of castles, distilleries and beautiful scenery.